Today is going to be a ‘two blog posts’ kind of day because I’m so excited to show you the work we’ve done on the house this weekend (do the scroll after this post if you want to read my Jenny Craig two week round up). For those of you that are new to my blog, I bought our house with my boyfriend last March. The only way we were able to afford a three-bedroom house in a nice area was by buying one that was stuck in a 70’s timewarp. Since then we’ve been living in a house full of textured wallpaper, built in wardrobes and pine cladding, slowly bringing our house back to the 21st century one step at a time! 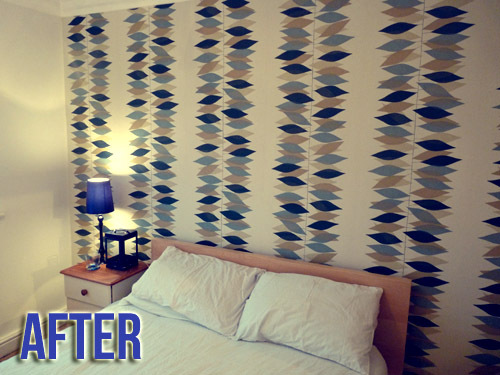 The spare bedroom began its life with bright blue textured wallpaper and a brown carpet. It was absolutely disgusting – I wish I’d taken a photo so you could see what a transformation it’s really been! A few days after moving in we stripped the wallpaper and painted it white, and not long afterwards Tom laid laminate floor. 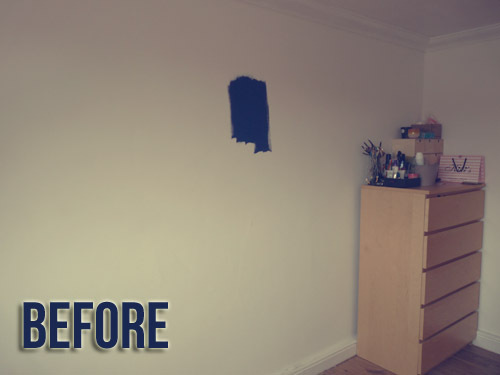 Since then it’s had a bed in, a chest of drawers full of clothes and a daub of blue paint where I started planning a colour scheme. 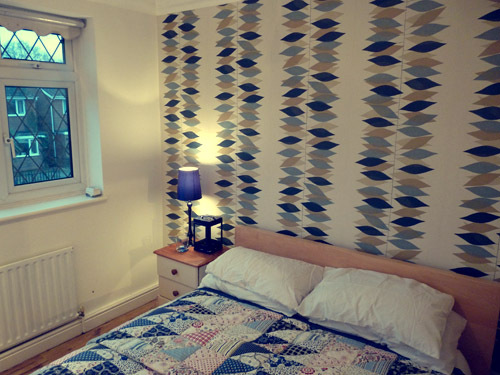 Recently I spotted this Sanderson wallpaper and knew it would be perfect to bring the room together. So today we hung the wallpaper, put up some pictures and put the various items I’d been collecting to ‘dress the room’ in place. Drum roll please…. tada! 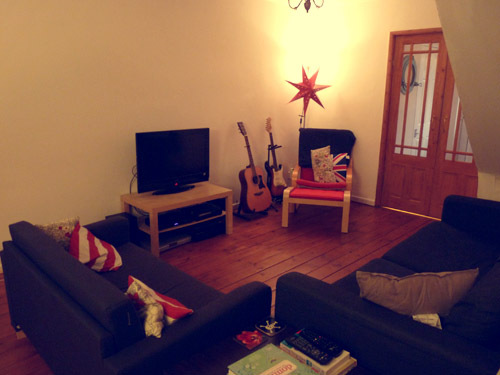 We’ve also done loads of work on the lounge – I haven’t got a ‘before’ photo, but we’ve tried to make it more homely by adding a new sofa, dismantling a huge, ugly Ikea TV bookcase and replacing it with a coffee table. 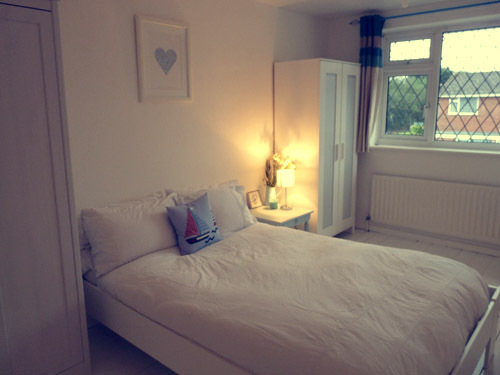 It’s so cosy now, it’s just a lovely place to sit and snuggle up with a good book! I’m so pleased the house is beginning to come together now. 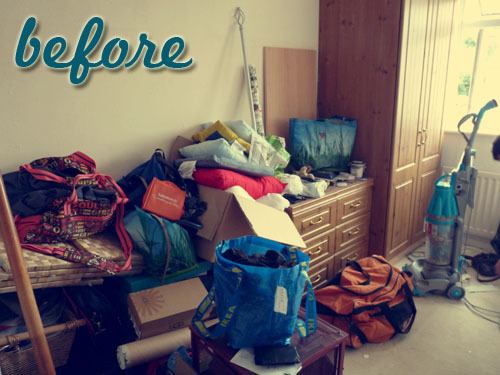 It just shows what you can achieve in a weekend – and do you remember my previous post where we redecorated the spare room in three days (it’s now the master bedroom because we loved it so much! It’s so nice to feel like you’ve really achieved something of a weekend!